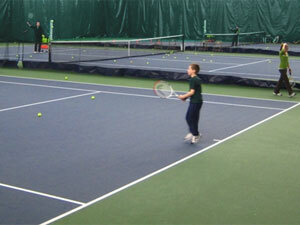 The Junior Development Program at Armonk Tennis and Armonk Indoor is for children of all ages and skill levels. It is designed to provide players with the most enjoyable experience, as well as the greatest opportunity to reach their full potential, with each level building on the skills developed at prior levels. 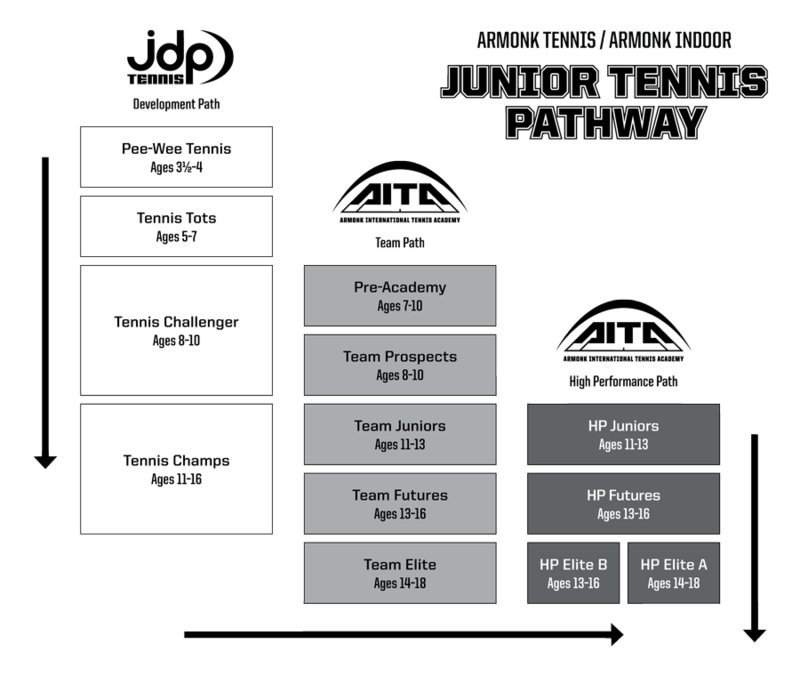 Our programs are in compliance with the USTA's Junior National Tennis Rating Program (JNTRP), which rates juniors from 1.0 to 5.0. Please read the descriptions below to learn the skills requirements for each phase of development. For more information, contact Tennis Director Doug Sherman at doug@armonktennis.com. 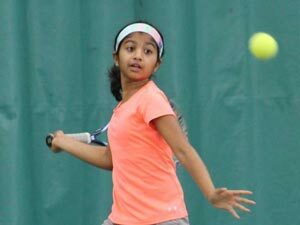 Note: Tournament-level players can also consider Armonk International Tennis Academy. To determine the appropriate program, see the junior tennis chart or contact us. Pee-Wee Tennis is designed to introduce preschoolers to tennis and begin work on the basics of serving, backhands, forehands, and volleys. Classes meet once a week for 30 minutes. Skill Expectations: Player is just starting to play tennis and is developing his/her motor skills. Equipment: Balls are red foam, rackets are 23 inches or smaller, and the court is 36 feet long. Tennis Tots teaches basic tennis and athletic skills, including stroke development and footwork. Classes meet once a week for 1 hour. Skill Expectations: Player needs to coordinate moving when hitting the ball and is still concentrating on getting the ball over the net from a stationary position. Player may be learning to serve and keep score. Equipment: Balls are red felt, rackets are 23 inches or smaller, and the court is 36 feet long. Tennis Challenger works on tennis knowledge and mechanics so that players can engage in match play. Classes meet once a week for 1 hour. Skill Expectations: Player is beginning to coordinate footwork when contacting the ball but is not consistent in hitting the ball over the net. Player can serve, but double faults frequently. Player understands scoring, as well as correct positions for serving and receiving. Player has limited success with volleys. Equipment: Balls are orange felt, rackets are 23-25 inches, and the court is 60 feet long. Tennis Champs uses a disciplined, games-based approach to help players go further competitively or recreationally. Classes meet once a week for 1½ hours, and weekly match play is held during the winter session. Skill Expectations: Player is able to judge where the ball is going and can sustain a rally of several shots with someone of the same ability using both forehand and backhand sides. Player has an understanding of the basic rules and can keep score unassisted, call own lines, and serve overhand. Player can volley with moderate success. Equipment: Balls are green dot felt or standard yellow felt, rackets are 25-27 inches, and the court is the full 78 feet long.